Africa has lost close to 9billion US dollars to climate related challenges since 1980. Yet more near future climate change related challenges are expected to retard the development of the continent. Rain fed Agriculture is dwindling and more people are likely to die from starvation and malnutrition. Floods and droughts are bound to multiply. In search of solutions, there is now need to connect climate weather information with decision makers in a bid to effectively manage this risk in the near future according to Jean-Pierre Roux of the Climate Development and knowledge Network CDKN Africa. Future Climate for Africa FCFA is a new ongoing project for Africa that will advance scientific knowledge understanding and predict climate variabilities in the next four years .It will support the integration of science in to decision making and demonstrate how this improved knowledge can be useful. Considering the setbacks that Africa has not been improving in climate science in the last decades on like other continents, this FCFA project will develop climate information in four regions of Africa. According to Jean-Pierre Roux focus will be to examine how climate science integrates with other challenges and how this important development tool can add or subtract to the worries that communities already face. 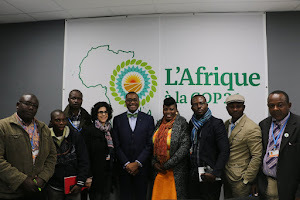 “So we will be demonstrating and also learning new ways on how to improve lives for Africa over these exiting challenges” Jean –Pierre remarked. Taking in to the existing plethora of challenges on the ground, science laps will be created and demonstration grounds planted in urban and rural settings to give access to decision makers, budding researcher’s scientist and communities to reconcile their idea with science data and to strategize how best these information and scientific data can be useful for Africa . “Research on visible climate science will be undertaken on a pan African and Regional level so that this data and research will and can help give a foray in to how development can be supported” Jean –Pierre added. In Jean Pierre vision this project will give birth to a new determined breed of African climate and weather scientists whose output will encourage and motivate development. “This will be felt in the grass roots as food will boost food crop production and other livelihood projects for the people of Africa will be boosted and good practices will be shared as well” He remarked. This FCFA project which is a low cost effective opportunity to enhance the prosperity of Africa through better climate change adaptation is worth 30milion US dollars. It is funded by the UK Department for International Development and the National Research Council that promotes the use of climate information in development projects.